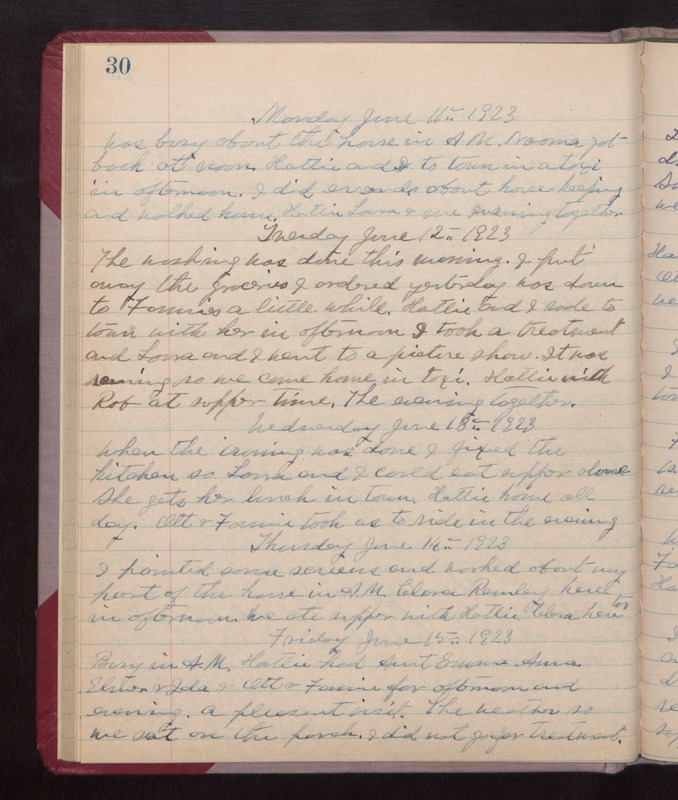 Monday June 11th 1923 Was busy about the house in AM. Norma got back at noon. Hattie and I to town in a taxi in afternoon. I did errands about house keeping and walked home. Hattie, Laura & me evening together. Tuesday June 12th 1923 The washing was done this morning. I put away the groceries I ordered yesterday. Was down to Fannies a little while. Hattie and I rode to town with her in afternoon. I took a treatment and Laura and I went to a picture show. It was evening so we came home in taxi. Hattie with Rob at supper time. The evening together. Wednesday June 13th 1923 When the ironing was done I fixed the kitchen so Laura and I could eat supper alone. She gets her lunch in town. Hattie home all day. Ott & Fannie took us to ride in the evening. Thursday June 14th 1923 I painted some screens and worked about my part of the house in AM. Clara Remley here in afternoon. We ate supper with Hattie, Clara here too. Friday June 15th 1923 Busy in AM. Hattie had Aunt Emma, Anna Esker & Ida & Ott & Fannie for afternoon and evening. A pleasant visit. The weather so we sat on the porch. I did not go for treatment.